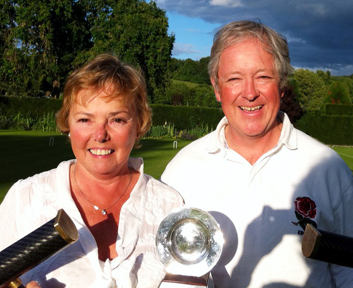 Frances Colman & Chris Roberts were undefeated in winning back their title after an absence last season, when they beat the holders Gary Yeates & Sue Bradley of hosts Winchester in a very close final today. This Southern Federation AC handicap tournament was well run by Winchester's Rita Nunn who coped well with a late illness related withdrawl Harry Midgley and his partner Michael Wiles. Phyllis Court had high hopes of lifting the Southern Federation's GC Armada Tournamnet Cup today but, despite being the top three seeds, all three of out pairs faultered before the final. The pairings of Helena Fensome & Pam Mead and Frances Colman & Raymond Wood shared third place after losing out inthe semis and the other pair Mike fensome & John Chalfont came fourth after losing to the eventual winners in the quarters. 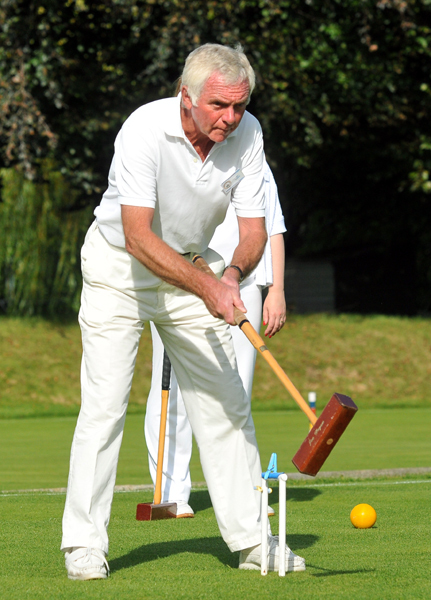 Ryde's Roy Tillcock and Jim O'Keeffe defeated Eynsham's Brain and Marion Hitchin to retain the titel for the Isle of Wight club at ythe end of an enjoyable tournament hosted by the Thames Valley CC. It was a real day of upsets, but a memorable one for Bruce Mason and Ralph Chambers, who won the 2013 cave & Wolfe Salvers Tournament today. The 5+ Tournament began with two clear favorites in the pairings of Mary Gaynor & Don Rutherford and the Earnshaws, Dilys & Alex. But both these fancied pairs were soon under pressure and on the recieving end of early results and both failed to make 'the cut' into the main knock-out stage. 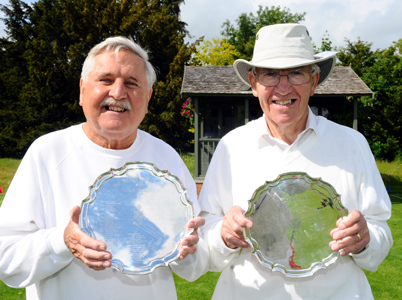 The other big surprise was the form of tournament debutant John Turner, who along with experienced partner Paddy Bunch made it through to the final, where Bruce and Ralph had just too much for them and won 7-5. A different looking PCC 'A' were too ggod for Baskinstoke and notched up an emphatic 5.5 to 1.5 victory today. Shorn of Charlie von Schmeider, Chris Roberts, and helen and Mike Fensome for a variety of reasons, our side stepped up to the plate and secured this useful win. Raymond Wood lead the side and with no.2 Ian Norris the morimng doubles rubber was soon in the bag. Pam Mead and Mary Gaynor completed won their singles too to give PCC 'A' a healthy 3-0 lead at lunch time. Wood and Norris then secured the result with singles wins in the afternoon but Mead and Gaynor both faultered, the lattter going down 1-2 and former halving her singles 1-1 (it was decided not to play out the third game as the match result was decided). So that is two winds from two outings for PCC 'A' but they still have the big guns of Winchester aand Ryde to come. 23rd June - Ian Norris wins at Wrest Park and goes to NATIONAL B-LEVEL FINALS! qualifying for the National Final in October. final that went to the 13th hoops. Really well done Ian! We have had to move the Ladies Championship to Monday 12th August from the date previously advised. family trophy for this event.